This watch could be a game changer like the iPhone was. But currently it isn't and it may never come to it. If you look at it through the eyes of an engineer in the Internet area, opportunities for applications keep popping up in head every five minutes. Unluckily, they are currently still confined to that location. The Pebble Watch was one of the first projects i backed in April 2012 on Kickstarter. It sold itself to me within seconds. Of all the projects i have backed, this is the one to have the deepest impact on my daily life. A lot of people thought so, with nearly 70.000 backers and over 10 million US$ collected, it was one of the first mega-sellers on the Kickstarter platform. It turned out to be rather complicated to get mine. It should have been shipped in September 2012. The project was delayed (not unexpected), i made a mistake by (initially) choosing a colored one and living in Germany made it even more complicated. The next mistake on my side was trying to re-route it through the UK, but the Royal Mail foiled that attempt by incompetence. So it took until August 2013 until my Pebble arrived. At least in the U.S. it seems to be straightforward easy to get one now. The price is 150$ on Amazon.com for the black version. Availability in Europe seems to be still spotty at best. One would expect that this has given the project a lot of hone firmware and the software around it. In this regard, the status upon arrival was a disappointment. The smartwatch felt essentially restricted to email/sms notifications and exchangeable watch-faces. But the Pebble project was only partially to blame since several constraints were in reality caused by the iPhone with which the Pebble was peered. This changed with IOS 7 and a new firmware & SDK in early November. Since then, a lot more things are possible that were previously just out of reach. Especially the capability to get every notification on the watch was a huge improvement. There are third party apps for the Pebble, but the number is far below my expectations. Only watch faces are implemented in abundance. I don't have the impression that third party developers are earning money, the scene seems to be dominated by enthusiasts. Using an e-paper display and by refraining from cramming an over-sized OS into a too small device gives Pebble has a decent battery uptime. Usually i charge it about once a week while not reaching really low charging levels. The watch looks good and the magnetic coupling for the charging cable is a nice (but not 100% reliable) solution. Using buttons as UI is a better choice than a too tiny touchscreen (at least for someone with fingers like mine). What applications do i use the Pebble for? My main benefit results from keeping my iPhone now in silent mode nearly 100% of the time. If it wants to tell me something, it has to go through the Pebble. This is a bigger improvement than it sounds at first. I no longer miss calls (because the iPhone is silent) or have it ringing at the wrong moments. Having a vibrating watch is impossible to miss but inconspicuous (once you get past the initial jump-a-yard-high-upon-vibrating-stage). I can even be physically separated from my Smartphone (for a few yards) but still notice incoming messages and calls. My personal killer app is using location based reminders together with the watch. Once i arrive at the supermarket, i get pinged with things i wanted to purchase. The vibrating alarm is also an excellent option to wake up early in the morning without disturbing anyone. But that's it, at least currently. Additional apps for the pebble like a step and distance counter are nice gimmicks but do not provide real value-add. Changing the watch-faces is nice to show off but my eyes are worn out by years of binge reading prefer the biggest digits possible to be used. Nice: the accelerometer is used to turn on the background light when you shake your wrist. The watch is 10-20% too big. I am not the smallest person but it still feels a bit over-sized for me. There is room for shrinking the case without reducing the display size. The peering with (at least with the iPhone) is not 100% stable. The Pebble is shown as two Bluetooth devices (why?). You can get it into a state where you have only partial functionality. Some notifications got lost or delayed while others got through. The rubber watch band that comes with it is not skin friendly (when there is danger of sweating). But the thing that prevents the Pebble currently from becoming "The Next Big Thing" is the lack of 110% engineering Steve Jobs has installed at Apple. There are a lot of small issues where the designers settled for 90% as good enough. An example is the magnetic connector for charging the Pebble which disconnects too easily. I don't know the technical restrictions inherently burred in the Bluetooth stack, but i would have put a lot of effort into the capability of maintaining connections to several other devices at the same time. But that leads to the next chapter. Using the Pebble as input device for your Mac/PC, e.g. to control presentations. It would be rather easy to recognize gestures like next/previous slide. As security device, the Pebble could provide one time passwords which can be combined with a PIN to log in or open doors through a connection with a lock. I am not sure if the Pebble will manage to achieve its gigantic potential. Samsung has botched (admirable completely) their attempt at a Smartwatch. But soon someone will without doubt perform a SWOT analysis on the Pebble and incorporate the result in their products. 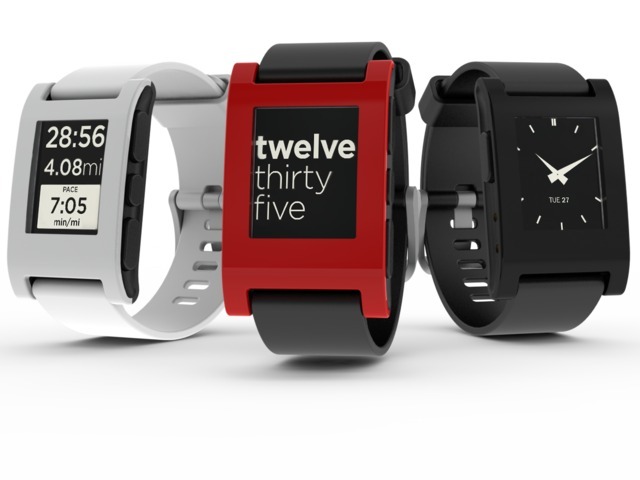 At best, the makers of the Pebble have a year to achieve their own breakthrough.